CONNEX = compliance in war crimes! 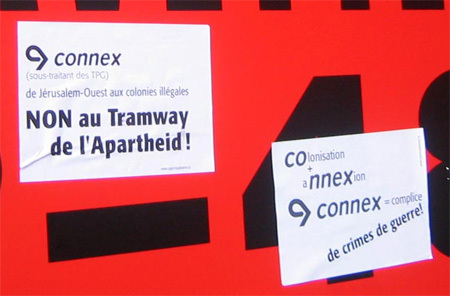 Swiss activists from Collectif Urgence Palestine stepped up their campaign against Connex, undertaking direct action against the company which supports the racist and Apartheid policies of the Occupation. 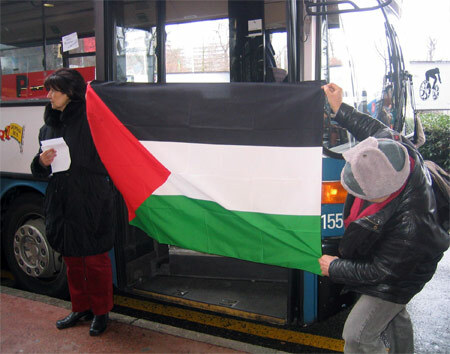 Interrupting the operation of a Connex operated shuttle, protestors showed the way in boycotting Connex and challenging it’s profiteering from Israeli Apartheid. 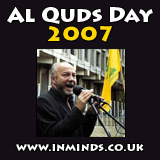 Connex successfully won a tender in 2002 to participate in a light railway system for the racist Occupation municipality of Jerusalem. Connex will run the railway - a vital transport link for the Jewish-only settlements throughout the city – with Occupation companies. Another French based company, Alstom, are also involved in the scheme, profiting from the Occupation of Palestinians and the ongoing Judaization of Jerusalem. Palestinian groups called for a worldwide boycott of Connex and Alstom in response to their support for Israeli war crimes. The efforts of Swiss activists reflect the kind of actions and solidarity work necessary to force Connex to end their support for Israeli Apartheid. On Saturday 11th of March at 2pm, around 40 activists interrupted the flow of visitors to the motorcar exhibit held in Geneva. They occupied a shuttle bus “Dupraz Bus-Connex” linking the city’s exposition hall “Palexpo” to the parking area. 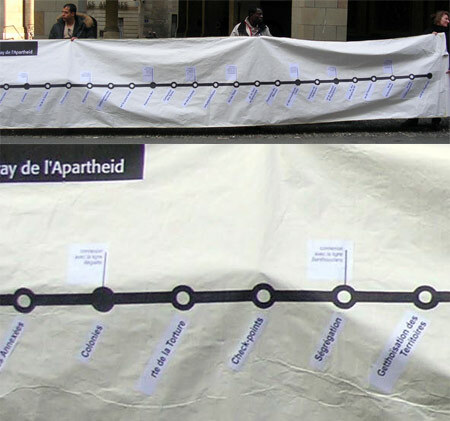 Banners were displayed and stickers put on the shuttle opposing the “Tramway of Apartheid”. Speeches and leaflets denounced the contract that has been signed between Palexpo and Connex for the shuttles that link the exhibit halls to the car parks. Until recently, the public transport group of Geneva offered the service. However, this year, private company Connex were awarded the contract. Collectif Urgence Palestine denounced the fact that the region of Geneva sub-contracts bus lines to Connex, highlighting that Switzerland as depository of the Geneva Conventions should not deal with companies that violate international law and support Israeli Apartheid in Palestine. Apartheid Tramway - stops along the way - Annexation, Colonies, road to torture, check-points, segregation, ghettoisation of territories.. The international campaign against Connex is picking up in different countries. In France, the home of the company, solidarity groups have successfully raised awareness about Connex’s complicity with the Judaization of Jerusalem. The issue has been taken up amongst trade union leaders who are currently targeting national decision makers. The campaign targets any corporate complicity with the Occupation, but underlines as well that business and political interest render ordinary people part of the international support for the Zionist project. Only by clear acts against this system, is it possible to halt the flow of aid and support to Apartheid Israel and show solidarity for Palestinians struggling for their liberation.